An illustrated anthology of poetry celebrating life in England's capital. 'Earth hath not anything to show more fair' said Wordsworth of London in 1802. Hundreds of years on, the same can still be said of Britain's largest metropolis. Favourite Poems of London is a wonderful anthology of poetry celebrating England's capital and life as a Londoner. 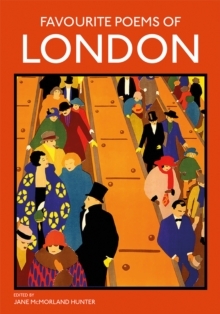 Verses from our best-loved authors, such as William Wordsworth, William Blake and John Betjeman among others, are accompanied by beautiful illustrations - often taken from iconic tube posters - of London's famous sights, green parks and Londoners in their daily lives. Epic poems celebrating London's vast and majestic presence sit alongside Cockney ditties about pie, mash and jellied eels in this new collection. Celebrating every aspect of 'the big smoke' - from the Houses of Parliament and the Blitz spirit, through to red double-decker buses and infamous rainy English summers - this is the perfect gift for any Londoner or visitor to the city.